This scholarship, in honour of the founding Deans of the Faculty of Education, will be presented, when eligible, to an entrance or in-course graduate student in the Faculty of Education with a good academic standing. Dr. Bill Hunter was instrumental in establishing the Faculty of Education when UOIT opened its doors in 2003. 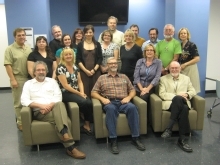 Under his tenure, the faculty secured accreditation for the concurrent and consecutive teacher education programs by the Ontario College of Teachers and grew the enrolment significantly. Dr. Jim Greenlaw succeeded Dr. Hunter and was responsible for the smooth relocation of the Faculty of Education from the north location to downtown Oshawa in 2008. In the last five years, Dr. Greenlaw oversaw and supported the launching of the innovative graduate programs in Education and Digital Technology while also bolstering the enrolments in the undergraduate programs. The passion and dedication of both Dr. Hunter and Dr. Greenlaw to UOIT and their professionalism as educators are second to none. Celebrate their accomplishments with us by contributing to the Faculty of Education Deans' Endowed Scholarship Graduate Award fund.